Oh yes, you’re reading correctly. That was my thinking last week while sitting in a warm, crowded neurology waiting room in a hospital that was advertised as closed to ill visitors of hospital patients. At least, that’s what posters on the entrance said, ‘No can do peeps, if you’re ill, you have to stay away’ (that kind of defeats the purpose of a hospital, right?). Reason: the winter vomiting bug, otherwise called the Norovirus. While watching people walking in and out, and talking to another patient, an unknown, small entity entered the waiting room in a red pram. You know the type, tree wheels, and as red as a Ferrari Formula 1 vehicle for mature, adult babies. I saw that Little Schumi was cute, and was introduced to his very strong vocal range when not hurling coughing and sneezing microorganisms in all directions. Perhaps more of a rock star than an F1 pilot, I gathered that dad would rather see him behind the wheel. Another sneeze came my way as the distance between the little fella and the ultimate destination of his bacilli was less than three feet between his tiny nose and my adult nose. Yes, that nose, that sniffling thing attached to an immune-compromised body that happens to be owned by myself. I agree with my lateral sort of thinking in this case. Wondering how far people’s sneezes fly is usually not something I occupy myself with, unless of course when I’m sitting in warm surroundings where endemic bugs tend to live, waiting to find a two-legged host. No joking, as far as I am concerned, any kind of bacteria or virus is an enemy of the state, Osama-Bin-Laden-times-one-hundred. There’s only one time people should look death in the eye in their life, and it’s at age 90, having lived a full life and having conquered themselves. Not at age 35, or 41. There’s also… well… People should never have to point on a chart what their bowel results look like every couple of hours, by picking any number between 1 and erm… well, yes, 10. You get the idea. If C. Diff is hunting me down again because of hospital-transferable-bugs, I’m emigrating to the South Pole, where I won’t be able to catch bacteria or other opportunistic viruses. Also, there is no way I will ever put my finger on a poo-poo-chart again. Ever! 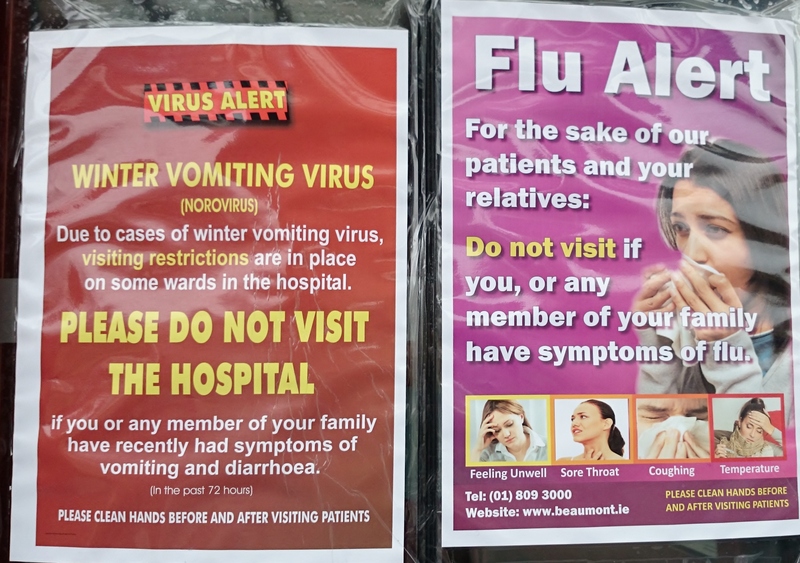 Either way, my question is if a hospital advertises that the Norovirus is present within its walls, why people want to bring a tiny baby – including grandmother and grandfather, to a small, warm waiting room filled with people with wonky immune systems. Space constraints aside, it still puzzles me, since grandma and granddad were present also. Not to forget, a bright red pram looking like a Formula 1 car. The obvious answers would be having another hospital appointment; wanting to show the parents the hospital surroundings; the mother is afraid of the neurologist’s words… I suppose I’ve seen inside out how quickly hospital bugs can spread and worse, how quickly a superbug grew within me, and how rejecting a phone call from my mom could have been the last phone call between us. But what can I say? I was thinking of the velocity of germs, and it turns out that “coughs force out thousands of tiny droplets of saliva. About 3,000 droplets are expelled in a single cough, and some of them fly out of the mouth at speeds of up to 50 miles per hour. Sneezing is even worse. It starts at the back of the throat and produces, even more, droplets — as many as 40,000 — some of which rocket out at speeds greater than 200 miles per hour. The vast majority of the droplets are less than 100 microns across — the width of a human hair. Many of them are so tiny that they cannot be seen with the naked eye. How Long Does Flu Germs Survive Outside the Body?